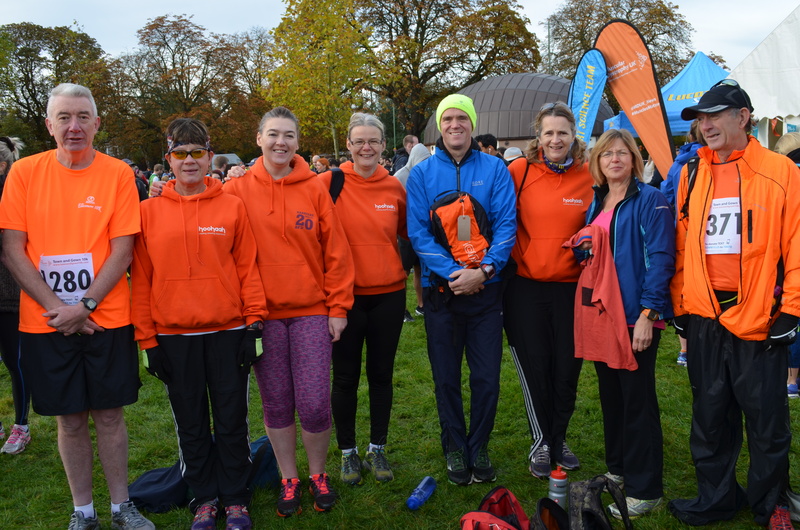 Lorna and some of my running pals displaying their strange fascination with the the colour orange. Suddenly the atmosphere dramatically changes and Lorna gives me the evil eye. What have I said or done? It’s not credible that I may have been indiscreet or committed a faux pas. Nevertheless, I am turned to stone! They all had a good race. I got repetitive strain injury in my camera button finger and limped around, ceaselessly attending to the needs of others. Roll on my recovery. Still injured and no running on the horizon. It’s an Existential crisis. Help! This is the best front page I have seen on a running magazine. It’s the current November 2015 issue. 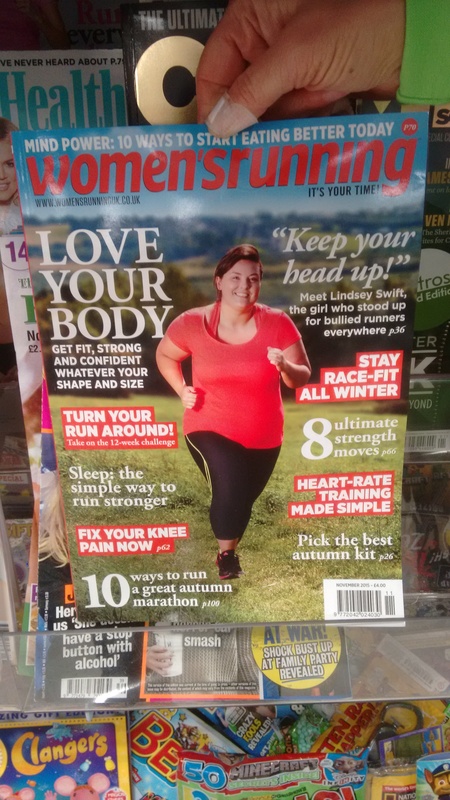 I suspect that most of the front page females (and the occasional male) runners are models, at least in the most popular mags and are hardly representative of the mass of people running. This picture shows an undeniably overweight young woman, enjoying herself and showing good running form. She’s overweight but looks fit. It’s a cliche but I’ll use it. She’s inspirational and this image will give positive encouragement to legion other potential runners. 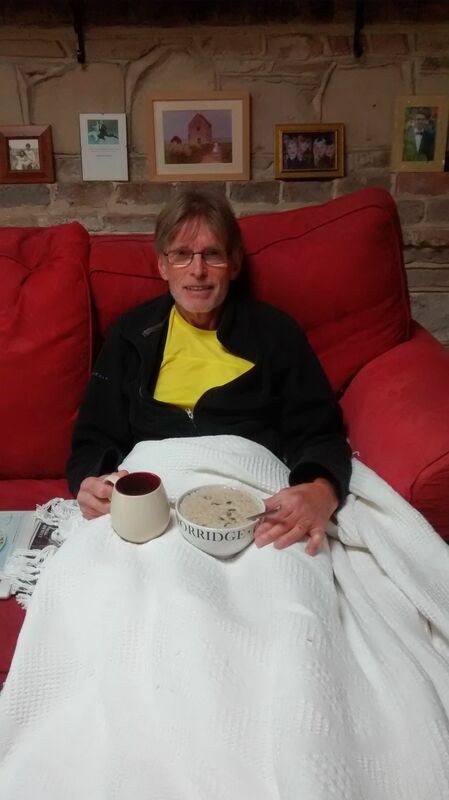 It’s two weeks since I fell at the Wimpole half marathon and injured my quadriceps. Recovery remains slow. I can still only go up stairs one at a time and I’ve only started to drive locally a few days ago. I did walk Cambridge parkrun last weekend (in 48 minutes) but in hindsight, it was a mistake and set me back several days. In hindsight, it was a mistake to continue to run 12 miles after I fell and also a mistake not to be doubly careful running over large rubble stones which really should have not been there in the first place. I can hear women all over the world mutter “typical male decision making”. I marshaled at Cambridge parkrun today. Very enjoyable. I spoke to Mary Holmes (75-79) who is still getting sub 30 minutes and asked after Peter Chaplin (80-84) who used to run at Cambridge but is no longer coming. That’s a pity. He’s still physically able to take part, I think. These two people are excellent role models and demonstrate that age need not be an insurmountable obstacle to running and physical exercise. 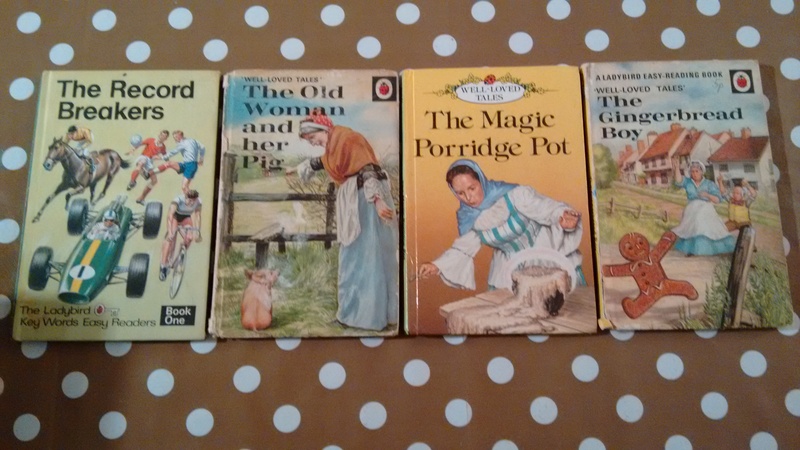 I came across a few Ladybird books in the loft recently.The Old Woman and her Pig and The Magic Porridge Pot are beautifully surreal stories and finely illustrated, much superior to the Disney-fied later editions. They were cheap, hardback, had pictures every other page and could be easily read in one sitting. Parents, seek these out on Ebay! But beware of the The Record Breakers (1970) which shows various sporting records. There are 19 text pages and 19 facing illustrations of superlative achievements by men. There is one page and picture of a female long jumper whose Elfin appearance makes her look like a young boy. So, no female role models in this Ladybird reading scheme. If you must own this edition, keep it under lock and key and show it to no-one, particularly children. I REMAIN SUBSTANTIALLY CLOBBERED. IT’S NOT MY FAULT. I BLAME THE EVIL TORY GOVERNMENT. 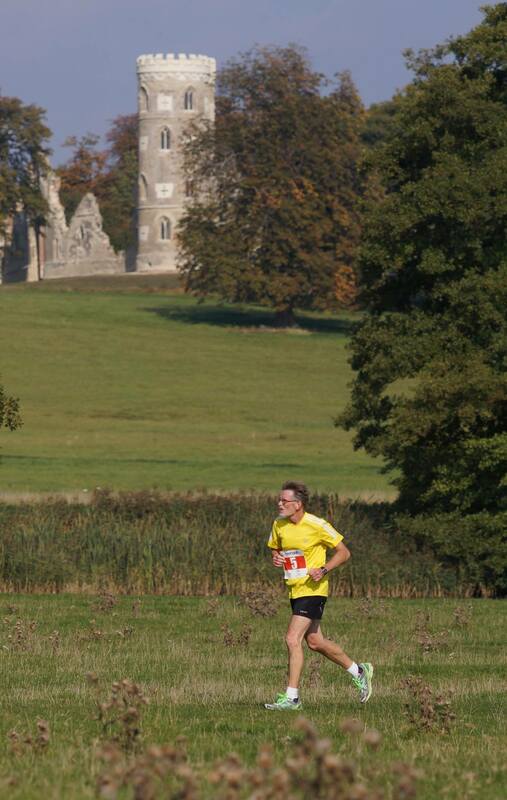 Six days ago, I came a cropper during the Hoohaah Wimpole half marathon falling heavily on rubble. My left thigh took most of the impact. I picked myself up, dusted myself off and started all over again (thanks, Nat King Cole). I fell at just over a mile in and continued running for the next 12 miles. By the evening I was hardly weight bearing on my left leg leg and couldn’t bent it at the knee. Now it’s six days on.There’s clearly been some improvement but it’s slow. I think I’ve had an impact injury to my quadriceps (and specifically to the rectus femoris), the type that footballers get when they get kicked in the thigh. I can walk but not jog, I haven’t been able to drive and I’ve got limited movement in my knee joint because any kind of stretching movement hurts. Today is parkrun day and if I didn’t do it, I know I would have been subjected to a torrent of hate mail, Sinton-Hewitt would have been on my case and people would have openly wept in the streets of Cambridge. 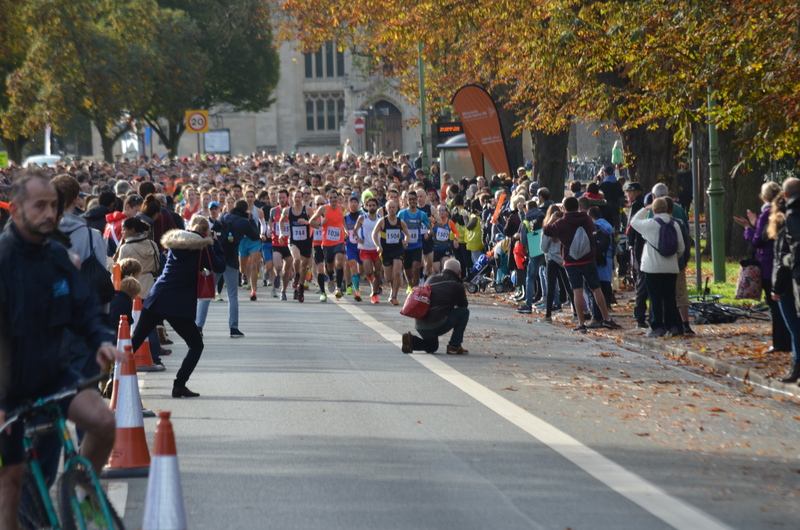 I don’t want that kind of attention so I decided to walk it .Usually Cambridge attracts around 450 runners and more often than not a few people are walking most of it. Unfortunately, no-one walked it today although I wasn’t too far behind the people in front of me. Cambridge junior parkrun provided all the volunteers , including the 13 year old run director Chloe who gave a very confident pre-run address to the assembled crowd. I was accompanied by tail runner 12 year old Ben who was very supportive to me and gave vocal encourage to the myriad runners who flashed past us. I hope he didn’t hear me grinding my teeth as I watched them recede into the distance. I came in at just over 48 minutes which, interestingly, is exactly twice the time I do it on this course when I go full pace. Young Benji, who has cerebral palsy, started late and came in a minute behind me. He ran with his mum and came in strongly to enormous applause. Hopefully, I may be able to gently trot around Cambridge parkrun next weekend and then the subsequent one will be my 250th. It won’t be a PB! Recent reports show the NHS in dire financial straits, suffering financial mismanagement, imply inefficiencies, experiencing poor staffing levels, missing targets and spending mountains of money on agency staff. If you treat the NHS as a market economy, require it to compete and make a “profit”, continuously emphasise poor financial governance, cut staff levels, employ dodgy borrowing devices with the private sector, continually reinforce the private sector has the nous, nerve and expertise to do a great (and cheaper) job and create standards which are designed to fail because of under funding, then it’s an inevitable set of outcomes. This is a very, very sad coroner’s report of the death of a mother and her newly born baby. She had a long history of mental ill health, sectioning under the Mental Health Act and had stopped medication in order to breastfeed. Tragically, she left a Bristol maternity hospital unchallenged and killed herself and her child shortly afterwards. Reading the coroner’s comments and conclusions, it’s hard to comprehend the apparent complete lack of joined up, considered care for a patient who is so obviously at risk.. Vulnerable mothers with a history of severe mental illness have been having pregnancies and births for decades in a health system which is a aware of the level of input required to ensure the safety and well being of mother and baby. I don’t think this event occurred because of a lack of understanding of the health requirements. I think it’s much more likely to be due to staff shortages, cost and unavailability. These days, I can’t accept that general hospital staff are so out of touch with mental health issues that they are capable of willfully ignoring them. 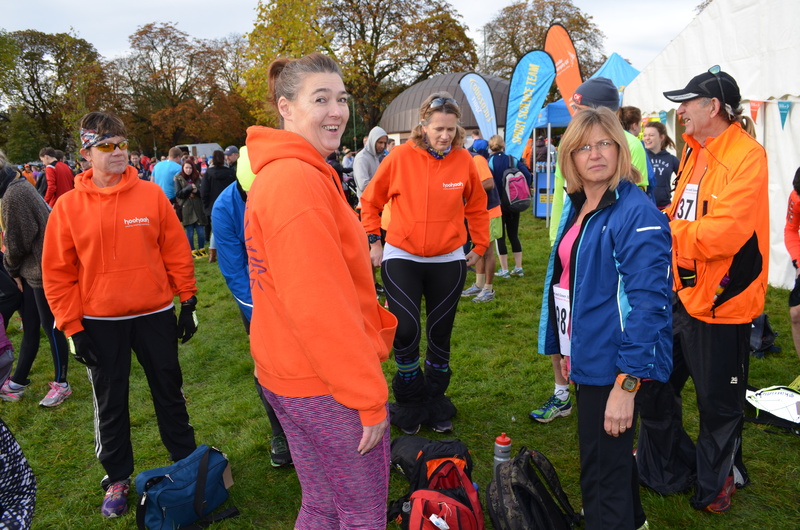 HOOHAAH WIMPOLE HALF MARATHON – I GET CLOBBERED !!! Here I am, cruising along effortlessly,way ahead of everyone apart from the 102 people in front of me. But this relaxed, highly efficient running style obscures a painful reality. At just over a mile into the half, we encountered a newly laid rubble farm road, full of large, sharp, vicious stones just waiting to wreak havoc. We had been warned about this surface and it couldn’t be avoided. Nevertheless, I failed to pick my feet up sufficiently, stumbled and fell flat. I don’t remember falling in a race before and I don’t intend to repeat the experience. It was embarrassing and very painful. I landed heavily on my left thigh and hands, got up, reckoned I was fit enough to carry on and started running again. My thigh continued to hurt but there was no discomfort in my knees or hips and the cuts on my hands were minor. I couldn’t see any bones protruding. So I carried on and did 12 more miles. When I stopped running my thigh started to stiffen up and swell. By the evening it was virtually non weight bearing and finding a comfortable position sitting or sleeping was very difficult. It’s more comfortable today although flexibility is limited. Still, given the fall and residual cold symptoms, I did OK. The weather was lovely, the course a delight (mostly) and I met up with a number of chums who looked after me. 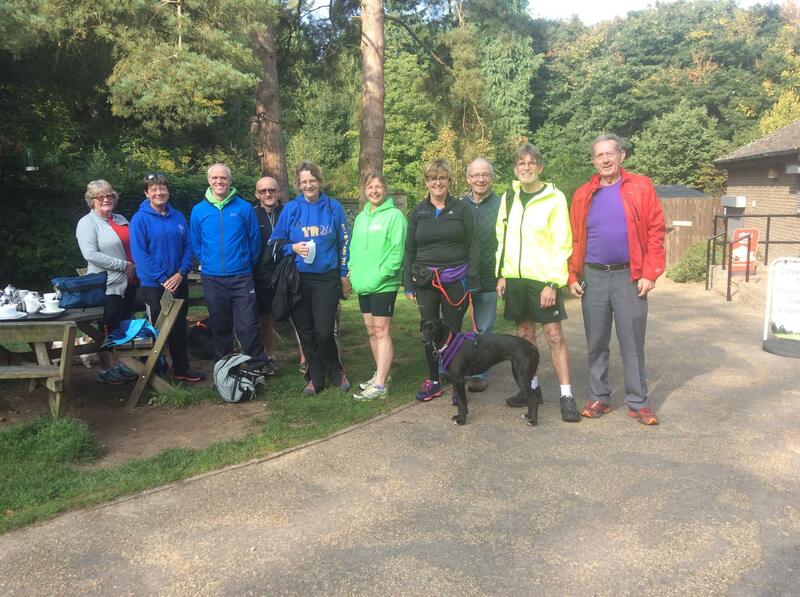 The previous day we did a bit of parkrun tourism and ran Brandon Country Park, a very enjoyable trail path about 40 minutes away from Milton. I am in a yellow jacket flanked by two running pals who didn’t run at Brandon. Kerry, in the red jacket, has a parkrun PB of 21 mins 24 secs this year and Mike, his arch rival, on my other side, has a PB of 22 mins 8 secs this year. They are both in the 65-69 age bracket and neither have been running longer than 3 years. There’s no justice in parkrun world. I think I’ll object to a higher authority on the grounds that parkrun is a social run not a race. They obviously take it too seriously. We seem to have done a lot of running and socialising this weekend!